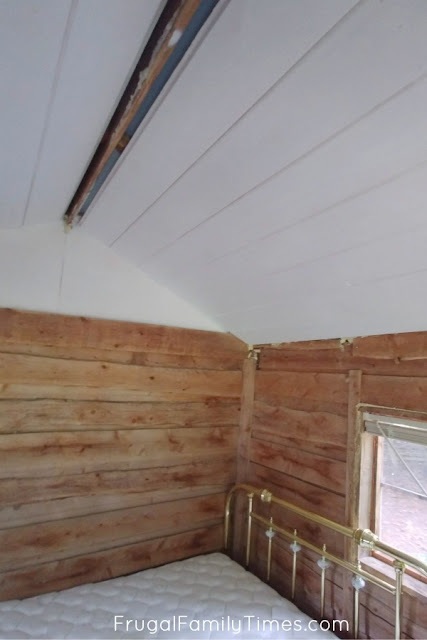 This shiplap ceiling was so easy to do, we weren't even planning to write up the tutorial. 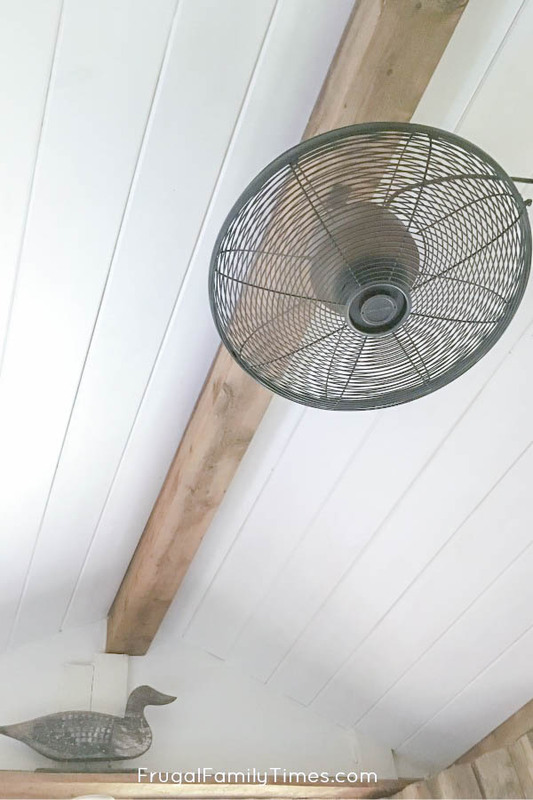 But after we shared our post about how to make a faux beam that we made look like reclaimed wood - readers started asking us how we did the shiplap ceiling, too. So here you go - a very simple tutorial for a very simple ceiling treatment! It feels fabulous to finally be working on the prettier parts that are infinitely more fun to share. We haven't talked much about our bunkie - which is weird because it's one of our favourite features of our weekend getaway! We've barely even shown you pictures of the place. You may have caught a glimpse of it in our recent post about how we transformed our totally tacky shed. There's the bunkie! It's got an adorable little porch that is begging me for a rocking chair. I never thought I'd own antlers! What you see here is the ceiling prepped: we've cleaned it up and put insulation between the joists. We looked at a few products and settled on this one. We liked the broad proportion of the 1X8" boards plus these boards are reversible - one side is smooth and the other side more rustic and rough. We knew we were going to build and install a rustic beam and the bunkie has rough wood walls, so we chose the smooth side for contrast. Choose your boards carefully. Look at all the edges to make sure they're not damaged. Look at the knots to make sure they aren't too lose or falling out. You'll also notice that we primed our boards first. Consider doing this - it's much faster to do them outside where you have space and don't have to hold your arms up over your head. You can be so much less tidy which equals speed! Installing the first board takes the longest. Just shy of FOREVER. But the reason it takes so long is because it's essential to get it perfect. If your first board isn't straight and level your whole ceiling will be wonky and will look awful. 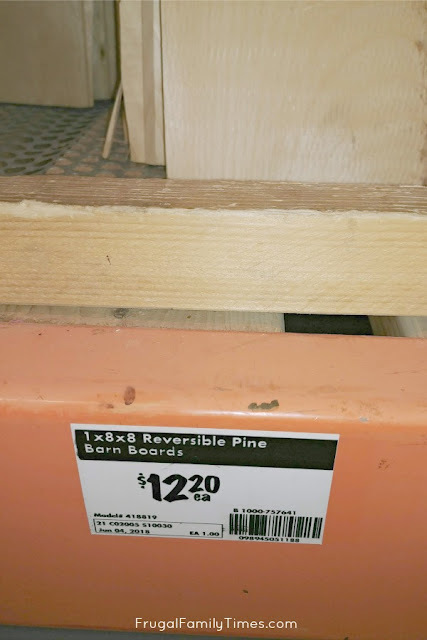 Double and triple check that your first board is level. 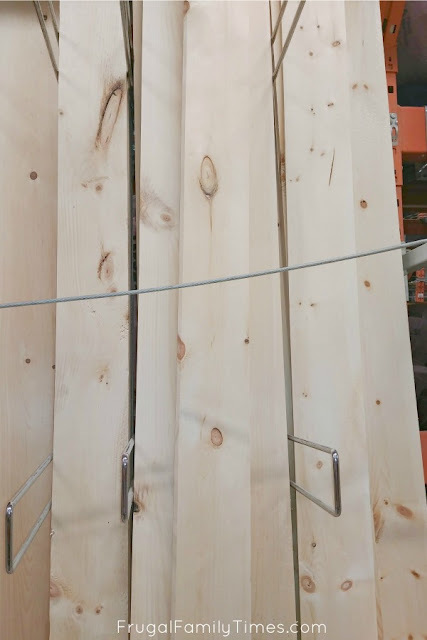 Nail your board in place along the corners and joists. A couple of nails in each joist should be plenty. Continue working your way up the ceiling. It won't take nearly as long as that first board. Almost done! With the ceiling in place, we were ready to make faux beam from wood. You can see all the details on that here. We chose this affordable outdoor ceiling fan - it's so good! We've got more projects from our Mobile Home Makeover for you to enjoy! Check them - including the story behind this unique property - here. For all of our budget DIY tutorials, click here.